Florence’s Baptistery’s Northern Doors are currently under restoration. 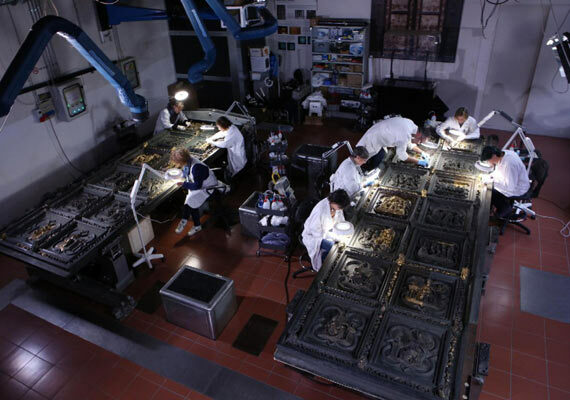 Last March, as we reported here, the doors were taken off and transported to the laboratories of the Opificio delle Pietre Dure to initiate the restoration process. While many stand and admire the Baptistery’s golden Eastern Door, known as the Door to Paradise, by Lorenzo Ghiberti, not many know that these northern doors were also done by Ghiberti and before, in 1400. The mastery he showed in the creation of these doors were what won him the commission to create the second set of doors to the Baptistery. Last Friday, the Opificio delle Pietre Dure held a press conference to let us know how the process was going, as everyone has been interested in knowing whether the doors could ever look as they were originally created. 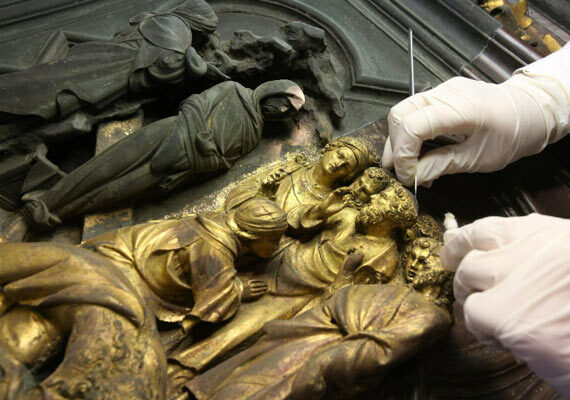 This is the first ever restoration of the doors, so the bronze doors have been exposed to the elements for over 600 years and accrued quite a bit of layers of soot and general process of transformation by the elements. As you can see from the photographs, it is with amazement that we can once again admire the splendid golden elements on the door as the layers of dirt and more are taken off. A major difference between this set and the Doors to Paradise is that Ghiberti used a more limited amount of gold here, found only on the relief sculptures and leaving the background in bronze. The restoration is to continue until the end of 2015, so a little over 3 years – and nothing compared to the 26 years it took to restore the Doors to Paradise! 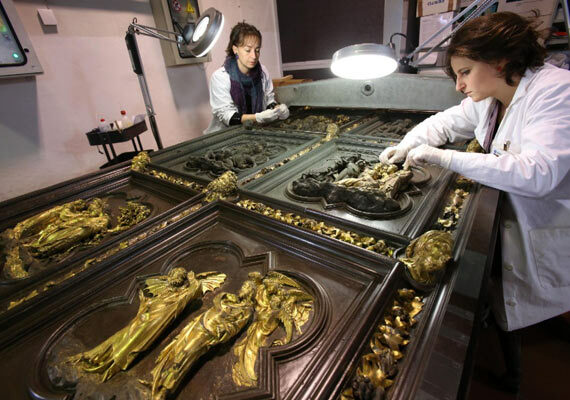 At the end of the process, the two sets of doors will be on display within the Opera del Duomo museum behind the cathedral. As for the actual doors on the Baptistery, as each of the panels is restored a copy is being made and placed back onto the doors at the Baptistery so you won’t need to wait the full 3 years to start seeing Ghiberti’s masterpiece return, albeit as a copy.